We’d love your help. 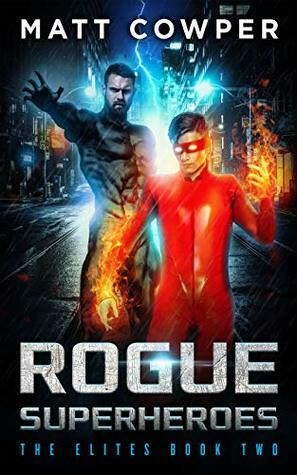 Let us know what’s wrong with this preview of Rogue Superheroes by Matt Cowper. To ask other readers questions about Rogue Superheroes, please sign up. When we left Nightstriker at the end of The World Savers, he was trying to apply the new convictions he'd adopted after The Elites encounter with the Giftgiver and his followers. Yes, the primary task for heroes like himself was to take on super-human threats, but other sources of injustice should be in their sights as well. Starting with corrupt politicians and government officials. Nightstriker, who seems to accumulate intelligence on ev This originally appeared at The Irresponsible Reader. When we left Nightstriker at the end of The World Savers, he was trying to apply the new convictions he'd adopted after The Elites encounter with the Giftgiver and his followers. Yes, the primary task for heroes like himself was to take on super-human threats, but other sources of injustice should be in their sights as well. Starting with corrupt politicians and government officials. Nightstriker, who seems to accumulate intelligence on everyone he stands next to in line at Starbucks, had plenty of dirt on them all -- and starts releasing some of this information to the Press. Suddenly, officials are forced to resign in droves -- and the stresses on the fault-lines of society increase exponentially. Suddenly, the nation seems on the verge of civil war, and Nightstriker comes clean to the team about what he's done. Before they can even decide how to react, their HQ is attacked and the President identifies Nightstriker (and because of him the rest of the Elites) as the source of the leaks and exposé stories. As they try to get out of the rubble that was their HQ, a new, government-controlled, team of heroes comes to arrest them. Before the Elites can really wrap their minds around what's going on they're on the run, hiding and licking their wounds. So the Elites have to clean up their image, defeat the new team, and try to help fix the mess that Nightstriker inadvertently created by not thinking things through as he should have. It's a good thing they're super-heroes, or this could be very daunting. That's not the whole book -- like before, a significant portion of the book is devoted to Sam (Blaze's) continued maturing and the growth of his powers. There are heavy prices for him to pay along those likes I have to say, but especially for the reader -- it's all worth it. The rest of the team have strong storylines -- and a good number of people from the previous book make appearances (some pretty significant). It's easy (and right) to focus on his "Big Three" and what's going on with them, but without the rest of these characters, the book wouldn't work. In the midst of a story where the stakes are so high -- Cowper throws in a lot of smaller stories, a good number of scenes that aren't involved in the overall story, but develop the characters well. It's a well-balanced story, just enough of things that aren't the overarching stories to round out things so you can take in all the details of the rest. I cannot tell you how many times Cowper did things with these characters I didn't see coming. Things happened to people (powered or not) and then the heroes reacted in ways that were shocking. Despite the fact that this is only the second book in a series, Cowper is clearly playing for keeps and won't be satisfied with simply injuring some characters. More than once, I had to go back and read a couple of paragraphs again just to make sure that Cowper had the chutzpah to do what I thought he did. "I couldn't have read that right, because that's just . . . nope, he did do that." It wasn't deconstruction and shocking moves for the sake of it, there was a reason for it all and it served the story, but wow. But that's not to say that everything is dark and grim -- yes, Cowper's Super-Hero stories are more like a movie directed by Zack Snyder than one directed by Patty Jenkins or Jon Favreau, but there are moments of joy, of small victories, even a little romance. The moments with Blaze and Metal Girl continue to be enjoyable and are a great break from the Nightstriker drama (even when the moments with the two aren't happy times). The character Anna, introduced late in The World Savers proved to be another source of relief from the tensions -- which is odd, because things don't really go that well for her for most of the book. Slab and Buckshot continue (in my opinion) to be under-served, but they both had opportunities to shine here, and we saw more aspects of their character. I do understand why they don't get the time devoted to them that Metal Girl, Blaze and Nightstriker get -- I really do. Also, I'll probably complain about Slab's use until Cowper gives him POV chapters that make up at least a third of a novel. Still, Cowper uses the characters well and I like them a lot -- he's probably right to give them the "screen time" that he does. It's better to leave readers wanting more, anyway, right? Rather than a "I don't know why we spent so much time with Buckshot, when we could've got some more awkward flirtation from Blaze" situation. A quick note -- I thought the original cover for The World Savers was just fine. But the new cover, that matches the look of this cover, is just outstanding (as is this one). It's a small thing, but the covers are great. I had a blast with The World Savers, but Rogue Superheroes surpassed it on every front, and I was excited to read it. I'm not sure how Cowper continues the story from where it is -- The Elites and the world around them were pushed to such extremes in these pages that topping this book might prove too much to try -- but if instead of trying to climb that mountain, he goes around it just right, it could be very satisfying. I am really looking forward to seeing how he proceeds (and how wrong he proves me). Unbranded author trying to write sentences that read good.